While such "calving" of icebergs is not unusual, this is an especially big one. It covers an area of roughly 2,300 square miles (6,000 square kilometers), more than twice the size of Luxembourg. Its volume is twice that of Lake Erie, according to Project MIDAS, a research group based in Britain. It broke loose from the Larsen C ice shelf, which scientists had been monitoring for months as they watched a crack grow more than 120 miles (200 kilometers) long. Scientists say global warming has caused a thinning of such shelves, but they differ on whether the latest event can be blamed on climate change. The iceberg is considered unlikely to pose any threat to shipping. And since the ice was already floating, the breakup won't raise sea levels in the short term, the project said in a statement. 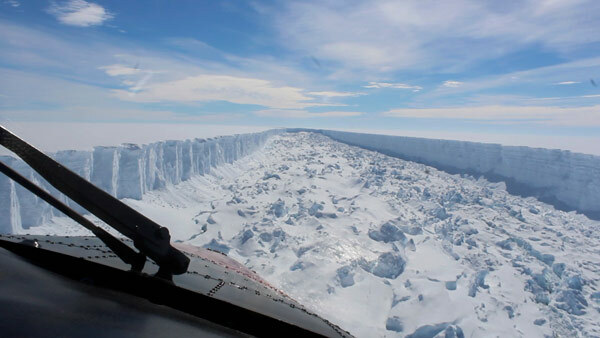 But it removed more than 10 percent of the ice shelf, and if that eventually hastens the flow of glaciers behind it into the water, there could be a "very modest" rise in sea level, the project said. Two other Antarctic ice shelves, farther north on the Antarctic Peninsula, collapsed in 1995 and 2002. That sped up the slide of glaciers, which contributed to sea-level rise, David Vaughan, director of science at the British Antarctic Survey, said in a statement. "Our glaciologists will now be watching closely to see whether the remaining Larsen C ice shelf becomes less stable than before the iceberg broke free," he said. Eric Rignot, a glaciologist at the University of California, Irvine, said the breaking off of the iceberg "is part of a long-term major loss of the ice shelves in the peninsula, progressing southbound and resulting from climate warming." But Swansea University glaciologist Martin O'Leary, a member of the MIDAS project, called it "a natural event, and we're not aware of any link to human-induced climate change." And a spokeswoman for the British Antarctic survey said there's not enough information to say whether the calving is an effect of climate change, though there's good evidence global warming has caused thinning of the ice shelf. As for any danger to navigation, scientists said the iceberg will probably break up and its pieces will circle Antarctica for years or decades rather than drifting northward into shipping lanes. Kirka reported from London. Ritter reported from New York.